Photo: One of everything please. The area around Sala Daeng BTS Station on Silom Road is a microcosm of Bangkok: backpackers, office workers, luxury travellers, street musicians, sexpats and wealthy locals all rub shoulders at restaurants, markets, pubs and shopping centres. And, of course, dozens of street food outlets dish out the fuel that keeps Sala Daeng’s wheels spinning. This part of Silom is known for many things, like the Patpong red-light district just north of the BTS station (we’d avoid that side), Silom Complex shopping centre and Lumpini Park. The abundant street food kind of gets lost in the shuffle, but this is a great place to give street dining a try. Vendors can usually speak some English, or at least point at their English menus. While a 2016 push by city authorities to “clean up the footpaths” put a dent in some of the street food, you’ll still find loads to choose from. Starting on the south side of the BTS station at the corner of Silom and Soi Sala Daeng itself, Nai Meng is a popular noodle shop in a venerable shophouse run by the same family for generations. 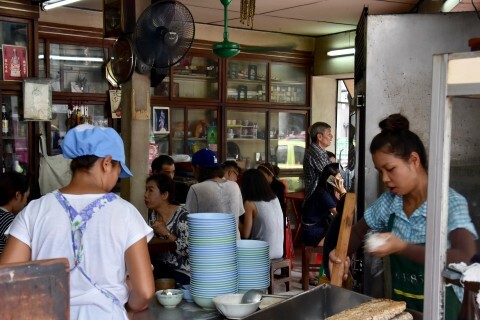 Served in a vintage space donning old glass cabinets and vintage ceiling fans, the 40-baht bowls of kuay tiao luk chin muu (noodle soup with pork balls and braised pork) are simple but satisfying, beer is available and the elderly owner strolls around chatting up the lunch crowd. After dark, another kuay tiao vendor sets up alongside a mango sticky rice cart on the opposite side of Soi Sala Daeng. Stroll west from Soi Sala Daeng on the same side of Silom and, after dark, you’ll pass street carts dishing out deep-fried prawns and miniature crabs along with Vietnamese-style fresh rolls, steamed taro and fresh-squeezed orange juice. Just east of Silom Complex, Kin Heng serves decent khao man gai (Chinese-Thai style chicken rice) in a two-floor shophouse eatery for 40 baht a plate. Just south of Silom Complex, with the BTS station looming above, a trio of old-school kitchens at shophouses numbered 205, 207 and 209 specialise in yen ta fo (noodle soup in a broth rendered pink from fermented soybean), ba-mii muu daeng (roasted “red pork” with egg-wheat noodles) or khao muu krob (rice with deep-fried pork belly), and khao man gai, respectively. All three have been going strong for decades thanks to a dedicated lunch crowd, but they stay open for dinner too. 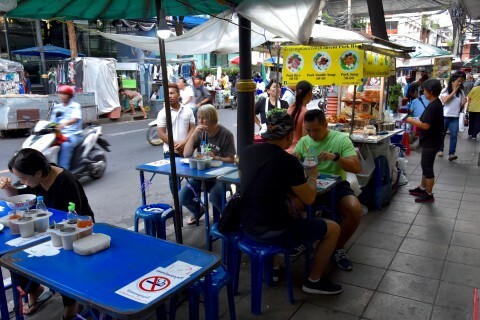 A little further east, look left from morning to afternoon to find a “kap khao” (with rice) setup with tables and trays of stir-fries and soups lining either side of an alley just west of Silom Soi 1. Pork-stuffed bitter melon soup, pumpkin with egg and scallion and clams drenched in chillies and holy basil are a few of the options found here—and it’s easy to order by pointing at whatever looks good. But do save room for the street food highlight of the Sala Daeng area: Soi Convent. Walk a little further west and a left turn down this side street takes you to a string of footpath vendors, most of them with available dishes posted in English atop the carts. Choose from more 40-baht dishes like khao ka muu (braised pork shanks with rice) and kuay chab (rolled rice noodles with pork and offal) before grabbing a seat at one of the footpath tables. During the day, don’t miss the delicious khao mok gai (Thai-Muslim biryani rice with chicken), while nighttime is all about muu ping (grilled pork skewers) at Hea Owen’s famous cart in front of the 7-eleven at the corner of Silom and Soi Convent. Though the papaya salad was overly sweet last time we tried it, Som Tam Hai Convent remains a popular spot for pla pao (grilled/salted fish) and Isaan salads on the east side of the lane. When you’re ready for a drink and some air-con, Molly Malone’s offers Guinness on draft while the more upscale Vesper shakes up sensational cocktails—and both are on Soi Convent. 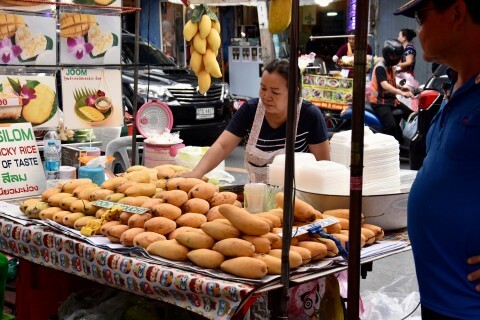 If the immediate Sala Daeng area doesn’t quite satisfy your street food cravings, you could continue west down Silom to Lalai Sap Market, the Silom Soi 10 food courts and Silom Soi 20.